You new shop has been set up to work with multiple currencies. You add in multiple currency options that a user can select to pay you in. You can use almost any recognised currency in the world as long as it has an ISO currency code. 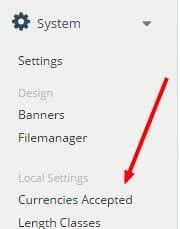 To add / remove a currency log into the admin area and click System > Currencies Accepted. This opens up the currency dashboard. All currency codes must be in UPPERCASE. The left currency symbol if the currency has one. An example would be the pound sign (£) for pound sterling. The right currency symbol if the currency has one. An example would be the euro sign (€). The number of decimal places used for a particular currency. Some currencies use more than 2 decimal places such as the Kuwaiti Dinar. The currency value compared to your default currency. If the currency you are entering is going to be your default currency you should set the value to 1.00000. The currency value will change automatically if you have auto update currency set to yes. 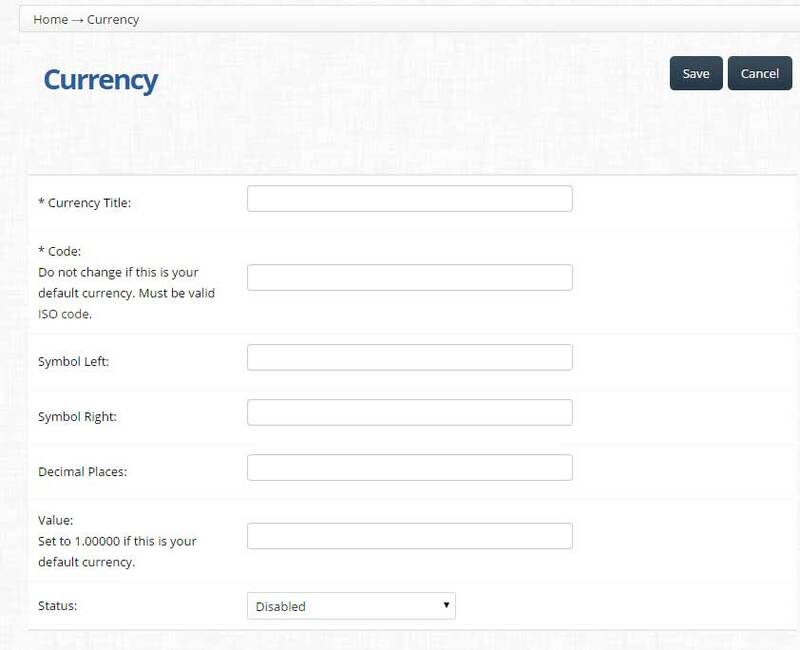 Currency status will determine if the currency is displayed on the front of site. Click save once you have filled in this information. To delete a currency simply select the tick box beside the currency and click the ‘Delete’ button. YOu then need to go to the settings page and click Local.